The Most Predictable LTL in the Northeast. You can’t pick a more predictable partner than A. Duie Pyle’s LTL Solutions. We have set the standard for on-time performance with Dashboard-to-Desktop™, our proprietary mobile communications technology. Our system of 24 direct-load service centers is networked together to tightly control the movement of products for our customers. 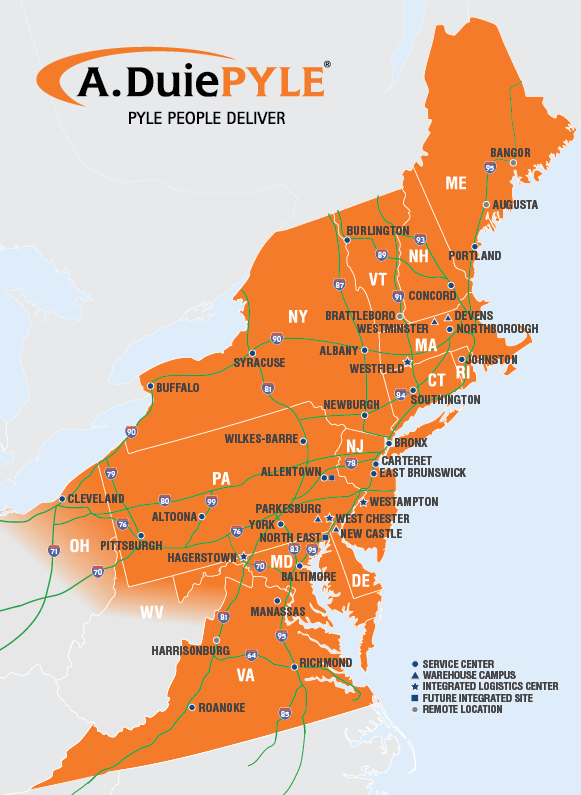 Pyle’s extensive infrastructure, combined with our advanced shipment tracking capability, modern fleet, our dedication to safety and customer service creates the most precise freight movement in the Northeast. We are the only regional LTL carrier in the industry to provide 100% Air Ride suspension as standard spec. on our trailers. Best equipped for shipment integrity in the northeast, A. Duie Pyle’s reputation for quality equipment and the most modern fleet demonstrates one of the significant advantages in specialized services for our customers. Pyle ensures safe and personalized handling of every shipment in every season of the complex Northeast marketplace. A. Duie Pyle's extensive infrastructure operates out of over 1,439 service center doors, with more than 1,520 drivers to meet our service commitments throughout the Northeast. Learn More. Pyle Priority and Pyle GEX (Guarantee Express) service guarantees reliable service for your time-sensitive shipments. Learn More. Protect from Freeze ensures that our customers can ship and/or receive water-based commodities regardless of the day of the week or temperature, no embargoes. Learn More. We provide a better supply chain solution for industries and product categories that require an acute level of attention to delivery window requirements, advanced mobile shipment tracking, claims management and performance reporting. Learn More. Our Assembly & Consolidation service provides a Northeast solution with all the predictability you need to prepare your shipments for the long-haul. Learn More. Our Volume Spot Quote program provides more pricing alternatives than ever before. Volume Spot Quotes require a minimum of 4 pallets OR a minimum of 5,000 lbs. Learn More. Our dedicated International Customer Service team ensures that your shipments are handled properly between major air and ocean ports and points in the Northeast. Learn More. A. Duie Pyle offers full value cargo insurance for goods moving over land through the Northeast, Southeast, Midwest, and Canada. Learn More.